What do we know for sure about Mohammed Emwazi? Mohammed Emwazi was born in Kuwait in 1988 and came to the UK in 1994 when he was six years old. He was educated at the Quintin Kynaston Community Academy in St John's Wood, north London. The then headteacher, Jo Shuter, has told the BBC that she never suspected that the "reasonably hardworking" pupil would become the man we know him to be today. Emwazi was 14 when Ms Shuter arrived at the school and she found him to be a quiet young man, with caring responsibilities outside of school as the oldest of a number of siblings. "He had adolescent issues," she said. "Particularly at that age - year nine, particularly the boys, is a time when the hormones start raging, and he had some issues with being bullied, which we dealt with. "By the time he got into the sixth form, he, to all intents and purposes, was a hardworking aspirational young man who went on to the university that he wanted to go to. "I can't stress enough, he wasn't a huge concern to us." He later graduated in computing from the University of Westminster in 2009 and his final address in the UK before he went abroad was in the Queen's Park area of north-west London. Emwazi came to the attention of the security services during the same year as MI5 and other agencies monitored suspected extremists linked to foreign fighters joining al-Shabab in Somalia. Going by the name Muhammad ibn Muazzam, he had travelled to Tanzania with another Briton, known as "Abu Talib" and a third man, a German convert called "Omar". Once they arrived, they were denied entry and interrogated and Emwazi later claimed to Cage, a campaign group in London, that they had been subject to harassment and abuse. The officer said Emwazi "brought chaos to the airport" by being "rough and noisy" and that he behaved "like alcohol was involved". His behaviour led him to being refused entry to the country, along with his two friends. 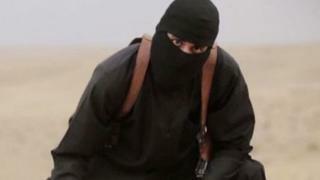 Emwazi later said he had been threatened at gunpoint and was told to ask the British government why he had been stopped. But Tanzanian immigration commissioner Abdullah Khamis Abdullah said no instructions had been issued from any other country to stop Emwazi. And the arresting officer said Emwazi was not tortured, as he later claimed. Cage said that Emwazi was questioned by both Dutch and British security services as he returned home via The Netherlands. The account he gave to the campaign group includes allegations that MI5 spoke to his fiancee - and she then ended the relationship. Emwazi himself was not charged with an offence. But MI5's view was that this had been no innocent post-university safari holiday. He was considered an associate of a number of high-profile suspected jihadists whom they were tracking across the world. One of them was a married man with two children whom we can only identify as "CE". He was placed on a control order in 2011 and forcibly relocated from London. During his legal challenge against the house-arrest style conditions, the security service's lawyers argued that his network included, amongst others, Mohammed Emwazi, "BX", J1 and Bilal Berjawi. All of these men were said in court to be involved in the "provision of funds and equipment to Somalia for terrorism-related purposes and the facilitation of individuals' travel from the United Kingdom to Somalia to undertake terrorism-related activity". BX - now known to be a man called Ibrahim Magag - went on the run and is widely thought to have reached Somalia. Bilal Berjawi, another Londoner, also succeeded in reaching the Horn of Africa. The ethnically Lebanese man had dual nationality and the Home Secretary stripped him of his British citizenship. Some time later he was killed in a US drone strike on militant targets. As for J1, in a 2013 court ruling on attempts to deport him the Court of Appeal described the Ethiopian as someone who had "thrown in his lot with a group of Islamist extremists who are committed to terrorism". J1 is, in turn, linked to some of the men jailed for the failed suicide attacks on London on 21 July 2005. Between late 2009 and early 2010, Mohammed Emwazi returned to Kuwait to stay with his father's family and, according to reports, look for a new life in the Middle East. The family are of Bedoon ethnicity - a group that is marginalised in Kuwaiti society. He was looking for a good computing job and was, according to Asim Qureshi of Cage, planning to marry and settle down. He spent three months working as an IT salesman before returning to the UK - but he never returned. According to Cage, he was prevented from returning to Kuwait when he was detained for six hours at Heathrow. He alleged that he was assaulted by an officer. Cage claims that he became desperate to leave the UK and that in 2013, he changed his name by deed poll to Mohammed al-Ayan and tried once more to travel to Kuwait. But he was stopped again. His parents reported him missing in August. Four months later police are said to have told the family that he was in Syria, although the family thought by now that he was doing aid work in Turkey. We do not know exactly when he entered the war zone but he was first reported to be in Idlib in the same year, assisting in guarding Western hostages. In August 2014, he appeared in the video which shows the murder of US journalist James Foley - and then over the subsequent months, similar films showing the killing of Steve Sotloff, David Haines and Alan Henning. In none of these videos is it clear whether it is the masked man or another person off camera who kills the victims. But in November 2014, the same militant features in a hostage death video - and this time he appears to be carrying out the killing of a Syrian military officer. He also stands over the severed head of American Peter Abdulrahman Kassig. Two months later the man features in another video in which he kills the Japanese hostage, Kenji Goto. This January 2015 video was the last appearance of the masked killer. A British newspaper later reported that it had seen new footage of Emwazi "unmasked" - although it was unclear when the video had been shot or whether the man in it was definitely Emwazi. In her interview with the BBC, Emwazi's former headteacher Jo Shuter said: "I can't even begin to say the shock and the horror that I feel. "Even now when I'm listening to the news and I hear his name I feel the skin on the back of my neck stand up because it is just so far from what I knew of him and it is so shocking and so horrendous the things that he has done."